A vinyl chicken leg which makes a squeaky noise when chewed. From 35p. Large Squeaky Vinyl Football. Carded and Bagged. From 80p. A large hard wearing dog toy squeaks when bitten. Carded and bagged. From 30p. Novelty Dummy dog toy that squeaks when bitten. Hilarity will ensue when you see your dog looking like a little baby. Carded and Bagged. From 30p. A squeaky can of dog beer. This item is carded and bagged. From 30p. 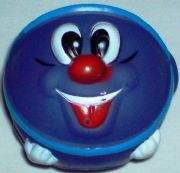 A vinyl drink cup which squeaks when bitten. Carded and bagged. Cheap Trade prices - From 35p. A vinyl duck which squeaks when bitten. Huge discounts for wholesale. Carded and bagged. From 35p. Novelty foot dog toy that squeaks when bitten. Hilarity will ensue when you see your dog with a foot in its mouth. Carded and Bagged. From 30p. 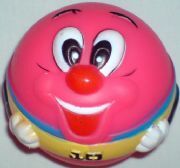 A vinyl squeaky football dumbell. This product is carded and bagged. From 30p. Squeaky joint of meat which squeaks when bitten. Carded and bagged. From 35p. Vinyl Pig dog toy with a comical face that squeaks when bitten. Carded and Bagged. From 30p. A vinyl tyre with a ball in the centre which squeaks when bitten. Carded and bagged. Budget prices to ensure you a bargain. From 30p. A quality dog toy squeaks when bitten. Carded and bagged. From 35p. Blue Ball with Cat Design! Food-alike squeaky toy, for when your dog is peckish.